We all want to learn the heritage of the places we live in. We want to learn from the past. We read stories because we want wisdom from the mistakes of the people who died. In the case of the history of the Salish Sea, there's so much to learn. It may not be enough to put all of them in one article. You need more than an hour to know every basic information about it. You definitely can’t read everything in this feature. But, we can attempt to put all of the essentials in this piece. We can try to summarize the stories. That way, we still have an idea of what happened in the Salish Sea without bombarding ourselves with too much information. Let’s start. The first important information you may want to know about the Salish Sea is its geography. That is why it’s useful for you to know that right now the Salish Sea is about 18,000 km2 wide. With that landscape, it comprises the inland waters and marine life of Juan de Fuca Strait as well as the Strait of Georgia, along with Puget Sound. These are the main islands that comprise the rich historical backdrop of Salish Sea. These islands are connected to each other with various straits, passes, and channels. 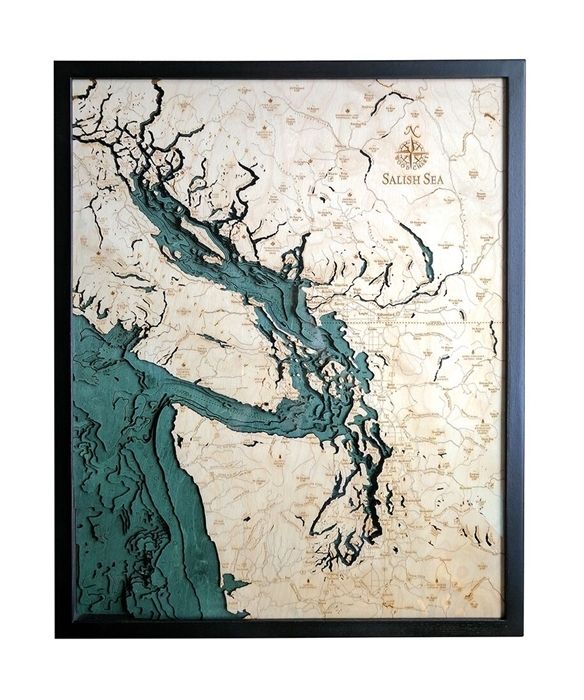 https://www.carvedlakeart.com/salish-sea-wood-nautical-chart-map-p/sali-d5l.htm Check out carvedlakeart if you want the best deals on lake art, wood map in Salish Sea, laser cut map, and charts of the lakes, streams and oceans of the world. You may also like to know that the Salish Sea uses various waterways to establish its boundaries. For thousands of years, the Native people found in the Northwest Coast of the region are the main settlers around the Salish Sea. Another historical fact about the Salish Sea is the trivia that it is one of the world’s biologically rich inland seas. With its unified and organized ecosystem that links to Washington State’s Puget Sound, it maintains itself as a wonderful place to explore nature. Politically, the Salish Sea is maintained and bounded by both Canada and USA. But, there’s no natural transition or barrier between the two. However, the mutual peaceful agreement between the two countries is what keeps the relationship of the two always in good standing. With regards to explorers who managed to first set foot in the Salish Sea territories, there’s a lot of them in the Salish Sea. The explorers are usually from European countries. With the explorations, many discoveries were revealed that transformed Salish Sea into a prime location today. https://www.carvedlakeart.com/salish-sea-wood-nautical-chart-map-p/sali-d5l.htm Check out carvedlakeart if you want the best deals on lake art, wooden map in Salish Sea, laser cut map, and charts of the lakes, streams and oceans of the world. Much of the history of Salish Sea comes from the ecological viewpoint One of the few important ecological history that Salish Sea has a lot to do with the major water bodies around it, which include the Strait of Georgia, the Strait of Juan de Fuca and Puget Sound. The vast flora and fauna of the land made the Salish Sea as a rich landmark of ecological research in the United States and Canada. Another interesting fact that you may not know yet about the Salish Sea is the fact that its boundaries reach from Desolation Sound to the north end of the Strait of Georgia. This gives the Salish Sea a wider scope regarding the lands it’s linked to.